Once the Offer to Purchase is signed by all the parties concerned, it is a binding contract. Remember that a verbal sale of immovable property is invalid. Check that the description of the property is correct (as described in the title deed). Are all the buyers' and sellers’ details documented clearly? Check that the purchase price is written correctly. Are you happy with the occupation date and occupational rent amount? Make sure you are aware of any special conditions and the time period in which these conditions need to be fulfilled, i.e. that the agreement is subject to a grant of the buyer's bond, or the sale of his other property. There may be movable items that can stay with the property. Are they all listed and are the movable items which are not included in the sale, listed? Check that the estate agent's commission is correct (as agreed upon). What happens if you make a mistake on the contract? If a mistake is made in a contract for example, the date is written incorrectly, it does NOT render the contract invalid. Such an error can be rectified. Rectification is the correction of the written record and does not allow for any additional terms to be included in the contract. Therefore omitted words may be added, extra words may be deleted and incorrect words may be replaced by means of rectification so that the mistake may yield to the truth of the matter. It is always in the best interest of all parties to the agreement, to initial next to the rectification, in order to eliminate future disputes about the mistake. Completing a Standard Pre-Printed Offer to Purchase Document and Drafting Clauses. All blank spaces must be completed fully or deleted completely. 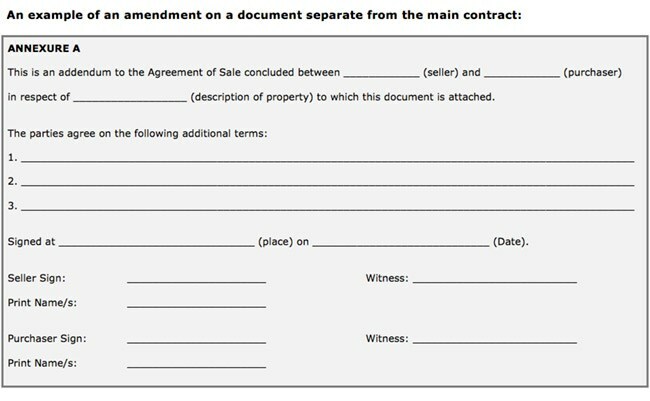 The words "to be agreed upon" may not be used in blank spaces as this could invalidate the agreement. Clear, plain language must be used to complete blank spaces or add clauses. It might be a good idea to draft a clause on a separate piece of paper first before writing it in the agreement. Irrelevant clauses must be deleted completely. Amendments to clauses must be clearly worded. All deletions and amendments must be initialled by all parties involved. There is usually space to add clauses, in a section called 'Special Conditions'. If this space is insufficient, additional clauses can be included on a separate document, but then the 'Special Conditions' clause must refer to the separate document, for example "See Annexure A initialled by the parties and attached hereto." The separate document must then be entitled "Annexure A", and must refer to the main contract. A contract can be amended after all the parties have signed it, as long as the amendment is in writing, signed by all the parties and, in the case of a separate document, attached to the main contract. It is not essential that the parties initial each page of the document, although it is recommended to avoid possible disputes. It is also not essential for a witness to sign a contract for it to be valid. The witness only really acknowledges that the contract was signed by the person whose signature he witnessed. Two witnesses must attest the signature of a spouse married in community of property who consents to an agreement of sale in a document separate from the agreement of sale. This article originally appeared in Property Power 11th Edition Magazine. To order your copy at the discounted price of R120 click here. The safest way to purchase your home is for your estate agent or attorney to draft the Offer to Purchase Document and thoroughly explain all the clauses to you. Once the offer to purchase has been made on a property, a seller has various points to consider. Estate agents specialising in residential property sales and letting can provide a great service to a buyer or seller.